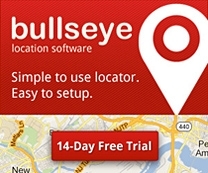 Bullseye provides a mature application platform that accommodates a lot of business needs for locators. This extends beyond just store locators and dealer locators. Over the years, we have also implemented a number of partner locators for clients such as Palo Alto Networks and Kerio Technologies. When we decided to launch our own partner program, however, we were thrown into slightly unfamiliar territory, basically becoming our own client. We needed to provide a solution to fill our own needs with a unique set of requirements. This proved to be an illuminating experience, which forced us to go through the same process our clients experience. We gained some valuable insight along the way. 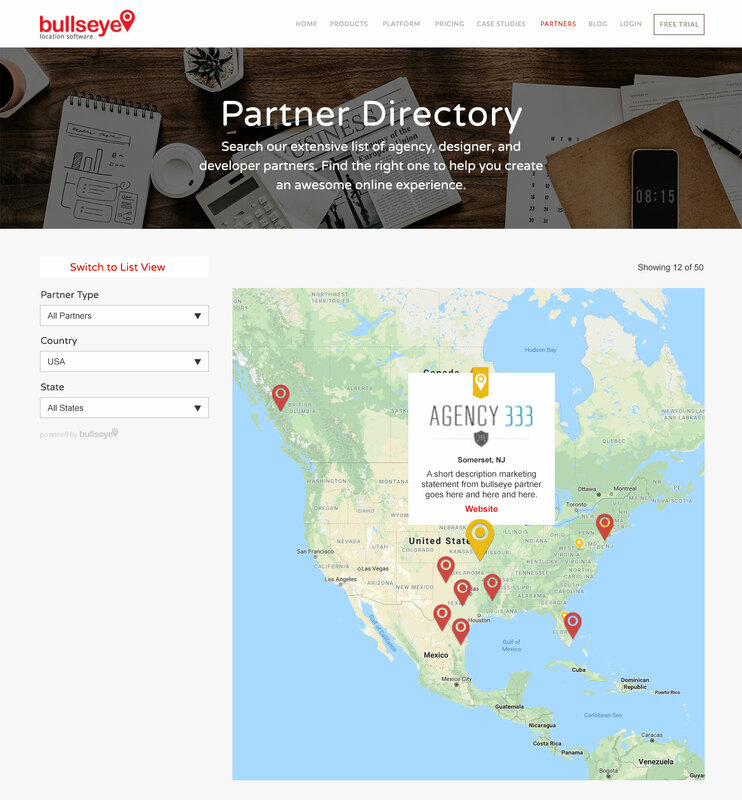 Bullseye Locations’ partner program is designed for agencies, digital marketing shops and development companies who want to offer Bullseye’s state-of-the-art store locator and location-based marketing functionality to their customers. Partners receive a 20% discount from the monthly or annual fees for our software, and can either pocket the difference or pass the savings on to their clients. We started our partner program as an incentive to resell our software, and also as a way to make our partners more successful at what they do. To do this we needed to connect our partners with buyers of our software. Our solution was our own Partner Directory. As the makers of store locator software, we know a little something about making it easy to find locations. But in thinking about the best way to show our partners we realized that not every locator is the same. Our partner locator presented some unique challenges. To start, we only had a few partners, but needed to accomodate for growth. We recognized that a partner’s location is relevant, but secondary. To start, we only had a few partners. That meant that our search couldn’t be that granular. Being able to drill down to the zip code or city level was potentially going to return disappointing empty results. To solve this problem, we kept our search parameters very broad, only filtering locations by Country, and then by State or Province. As our directory grows, we can add an additional level and filter down to the city or zip code if necessary. We wanted to show global nature of our partner network. For promotional purposes, every industry wants to appear bigger than they may be, with greater global reach than they may have. To solve this challenge, our partner map loads showing all partners, and our country filter suggests to the user that we exist in multiple countries. A partner’s location is relevant, but secondary. A store’s location is one of the most important things about it! Being near a store may be the deciding factor of where a user shops. In the case of partners, we wanted to connect users with a partner, but their location wasn’t the most important thing since technology services can be provided from anywhere regardless of geography. Providing a way to connect through phone, email, or a website was what our desired goal. To solve this challenge, the directory is loaded as a list initially instead of a map, though you can switch to the map view. Each listing can provide a contact name and email, phone number, and/or website, if provided by the partner; only the city and state are shown to identify the partner’s location. We wanted to highlight our most successful partners. One of our goals was to recognize and reward our partners as an incentive to them to be more successful. 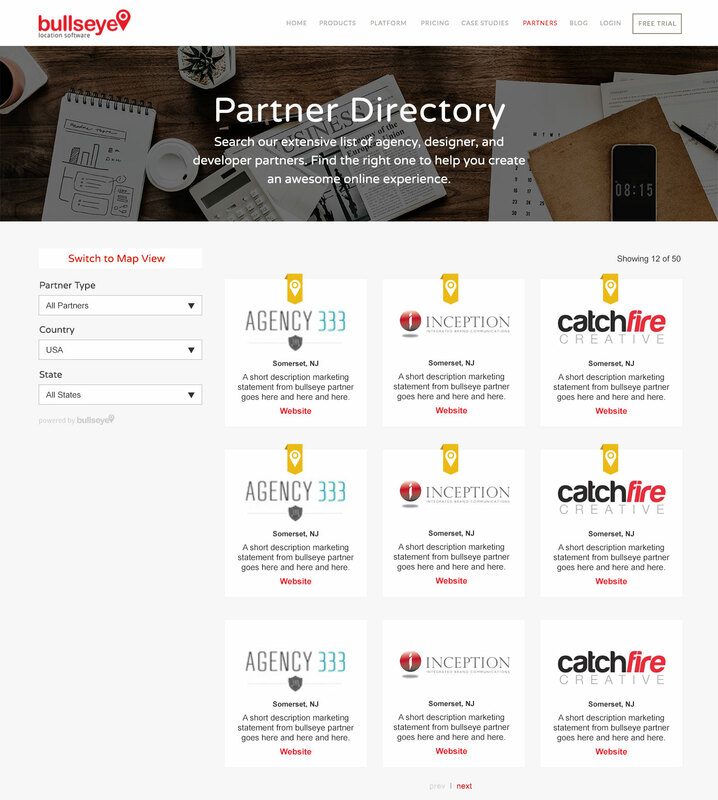 The partner directory met this goal in part, but we wanted to make our exceptional partners stand out. To solve this decided on criteria to identify “Gold” partners, then listed them first, and embellished their listing with a gold ribbon. We leveraged our store locator software and powerful API to automate much of the functionality needed to make our partner directory work. You can learn more about our partner program, and take a look at our directory at https://www.bullseyelocations.com/partners-store-locator-service.